Avoid Worksite Accidents And Fatalities With Proper Safety Tools – Forklift Safety Harnesses, Advanced Warning Systems & More! Forklifts are incredibly powerful machines. Improper operation often leads to injury and fatality on work-sites. According to OSHA, about 12 fatal injuries happen every day in the U.S. The first step towards improving safety on worksites is through quality forklift operator training. Competent operators can drastically reduce the number of accidents that occur, both to the operator and other workers. However, training is not always enough. You also need to take into account the appropriate safety tools needed to fully protect workers and others nearby. From advanced warning systems to a forklift safety harness, there are many tools available and accessible to prevent accidents and injuries on the job. This applies to any forklift operator, whether inside or outside, at a construction site or warehouse. Let’s take a look at some of the best ways to stay safe while driving a forklift – including the forklift safety harness! Harness and Lanyard. 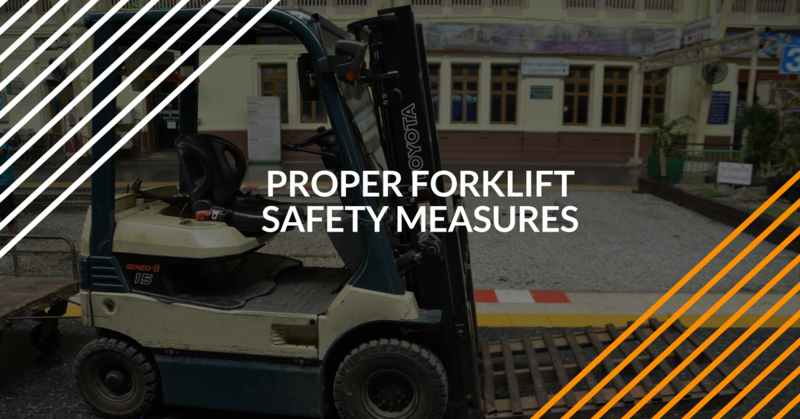 As one of the most common causes of injury and death on work-sites, falling from a forklift needs to be taken very seriously as well as the correct precautions to protecting the operator. Make sure all workers wear a forklift safety harness when operating forklifts to prevent injury and death from falls. They are made from light-weight polyester material and will remain comfortable all day long, so there is no excuse to avoid wearing one. According to OSHA, the most common cause of death in equipment workers is falling. Although OSHA does not require forklift operators to wear a safety forklift harness, they do require workers to protect themselves from serious recognized hazards. This is mainly due to the fact that falls are completely preventable, especially with the use of fall protection systems like a body forklift safety harness. Fall protection systems should be used whenever a worker is working at a height of six feet or more, and it is important to remember that falls happen when you least expect it, even at only six feet high. A full body forklift safety harness with a shock absorbing lanyard or retractable lifeline is one of the best forklift safety products to prevent falls and protect your life. When a harness and a lanyard are used simultaneously, they are the most effective at protecting workers from a falling forklift. A lanyard attaches to the forklift safety harness on one end, using a sturdy metal hook, and attaches to the forklift with the other end. Once everything is locked into place and the operator is wearing the forklift safety harness, if the forklift should tip over or the operator should slip, the operator will not catapult out of the forklift. This is because these two systems distribute the force of the fall throughout the entire body of the worker. There are a few types of body harnesses available to workers. These include class 1, class 2, class 3, and class 4 body belts, or harnesses. Class 1 involves a body belt that includes a single or double D-ring that is designed to restrain a worker in a hazardous work position and reduce the risk the falling. Class 1 body belts are only used for positioning. Class 2 forklift safety harnesses are chest harnesses that are used when there is little risk for a fall to occur, and they are not appropriate when falling risks are high for a vertical free fall hazard. Chest forklift safety harnesses are used to retrieve people who have fallen into a tank or large bin. Class 3 involves the full body forklift safety harness that should be used when there is a serious risk of a vertical fall. Class 4 is for suspension belts which are independent work supports used to suspend a worker mid-air during a job. Class 3 full body forklift safety harnesses are going to be the absolute most effective method for preventing fatal falls. High Visibility Reflective Vest. Limited sight is often the case on work-sites because work cannot be postponed due to heavy rain, snow, or sleet. Every forklift operator should own a reflective visibility vest to improve visibility on poor weather days. They are most commonly seen on construction sites and are typically bright orange in color with strips of reflective tape. Lighting–Pedestrian Warning Spotlights and Strobe Lights. Lighting is most commonly associated with alert symbols, and it can prevent pedestrians and other workers from coming too close to a work-site. Spotlight lights and strobe lights can be attached to the top and sides of the forklift and are usually bright blue or a flashing orange strobe designed to signal others of safety hazards and to stay away. Advanced Warning Systems. Advanced warning systems include flashing signs reading “Warning” with an arrow, “Caution” with an arrow, or specifying “Crane” or “Forklift,” as well as audible warnings to alert pedestrians of a working zone. Look for alarm systems that are auto-adjusting, meaning they detect the level of noise in an area and adjust the noise of the alarm to be louder than the surroundings. Clear Cap Overhead Cover. A clear cap overhead cover is a product that rests on top of a forklift to protect the driver from contact with rain, snow, hail, and harsh sunlight. Quality products are designed with ribbing and gutters to ensure the precipitation drains off of the forklift and does not spill directly in front of the operator’s vision. During extreme weather conditions, operators should use a full enclosure cover to protect them from the elements on all sides. Adequate Forklift Operator Training. Before an employee should be allowed to drive forklifts, all workers need to be trained and certified to operate forklifts. Training includes recognizing safety hazards and properly examining a forklift to ensure there are no mechanical issues. The certification program with ForkliftCertification.com is fast, convenient, affordable, and 100% OSHA compliant. Once the online, self-paced portion is completed, the student will complete a practical skills test led by one of your experienced operators to judge their operating techniques. In one day, you can have fully trained and OSHA compliant operators to reduce accidents. Additional forklift safety tools involve ensuring equipment safety. These include forklift battery safety products, propane safety, forklift ergonomics, facility and product protection, and more. Identification products and signs are also essential safety products. They include warning tape, safety posters, equipment safety labels, and safety tags, as well as stand-up caution signs. Portable safety barriers are also included in this section which are used to rope off a dangerous area. Forklift battery safety includes products like battery roller stands, traveling battery stations, “battery buddies,” dissipater forklift battery caps, forklift battery lifting beams, as well as an automatic watering system, portable forklift battery watering cart, and a forklift battery watering gun. Propane safety involves propane cylinder handling gloves, propane cylinder retracto-gloves, a low propane fuel indicator kit, carbon monoxide detector card, leak detection compound, low propane fuel gauge, and cylinder loaders and storage cabinets. Forklift ergonomics include seats, backrests, anti-vibration cushions, neck support systems, and suspension seats. OSHA compliant forklift operator training combined with the proper forklift safety products is the most effective way to reduce the amount of accidents on work sites. Sign your workers up today for forklift certification, and receive competent operators in less than one day. Check out ForkliftCertification.com for all your training needs and to learn more about the top forklift safety products in the industry. If you’re ready to become OSHA certified today, click here to get started with our training courses today. From forklift safety harnesses to proper load stability techniques, FLC has your entire training needs covered! For any questions with your forklift safety harness training or other certification needs, give our OSHA experts a call today at (888) 278-8896. Want More Helpful Forklift Safety Harness Tips? Seatbelts are critical safety devices for automobiles. So it only makes sense that they’re also important for forklift operators. Some forklift drivers think seatbelts and forklift safety harnesses are only to be used for “hazardous” duty. But the plain fact is this: every time you get behind the wheel of a forklift, potential danger is around the corner. OSHA considers seatbelts required safety devices, and this blog reviews the advantages of using one every time you operate a lift. In this widely-read piece, our OSHA forklift safety experts go over some of the most common applications related to sensible forklift safety harness use. What’s the link between consistent forklift safety harness use and preventing accidents? How can seatbelts aid you in the case of a tip over? What are the main causes of forklift tip-overs, and how can forklift safety harnesses and seatbelts help? Read this blog, and get all the answers you need! Why Would a Forklift Tip Over? According to official OSHA accident statistics, there are roughly a dozen deadly accidents every day throughout the United States. Some of these fatalities are caused by forklift tip-overs. How and why forklift tip-overs happen is due to many factors. 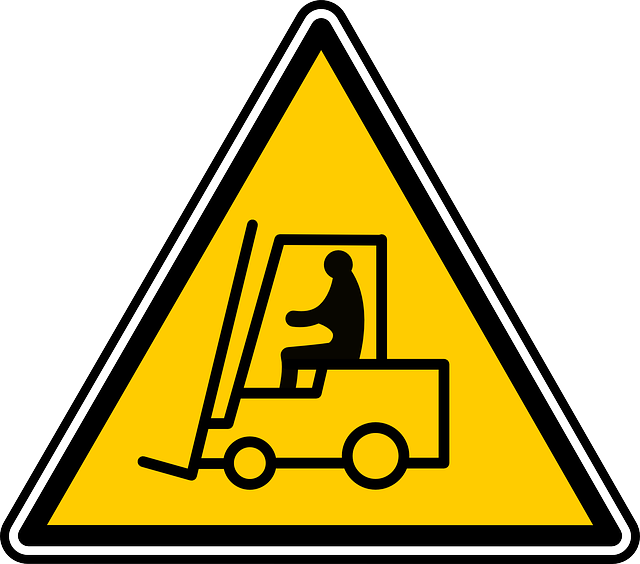 To learn more about this common forklift accident and how to prevent them, here’s an informative article from the FLC blog knowledge base. Since we’re often asked what causes tip-overs and how to avoid them, our safety experts decided to explain the subject in more detail. Plenty of questions surround forklift tip-overs. Will a forklift safety harness aid during such an event? What are the most common causes of forklift tip overs? What do experienced forklift operators have to say about preventing them? This blog organizes forklift tip overs into the two main types – sideways and forward tip-overs – and explains the causes for each. This post was originally published in 2015 and updated in 2018 to include more information and links to helpful resources.